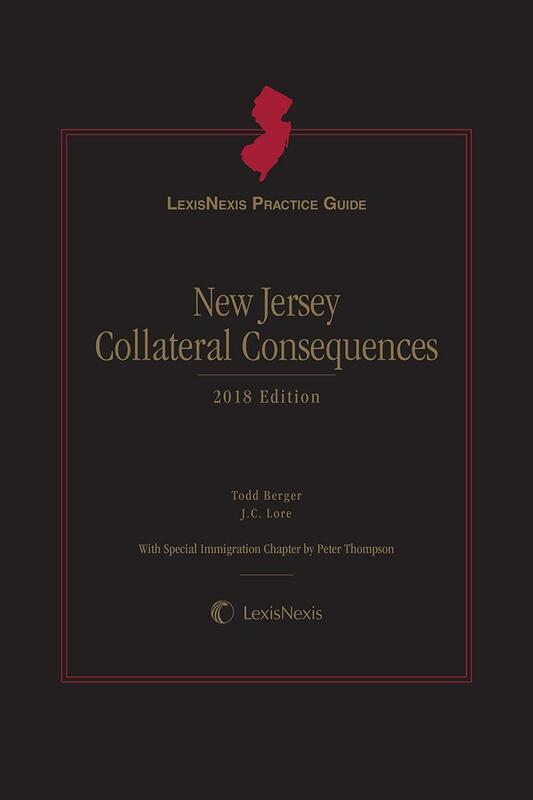 Practice Guide offers concise explanations of collateral consequences flowing from specific New Jersey criminal convictions. 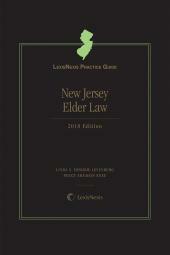 With its concise writing style, streamlined chapter format, extensive appendices, extensive references to leading and related cases, cross references to relevant analytical content, and authoritative guidance, you'll find more of everything that makes a practice guide valuable and easy for you to use. 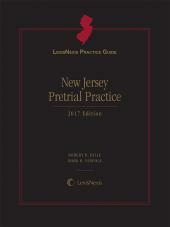 Written by experienced practitioners, the Practice Guide offers concise explanations of collateral consequences flowing from specific New Jersey criminal convictions, general classes of offenses and general types of offenses, as well as unique practice strategies, checklists, and appendices to ensure that the practitioner identifies and addresses all the collateral consequences related to each crime. Each Practice Guide chapter combines authoritative legal analysis with an expert author's practical insights, distilled from years of litigation practice. 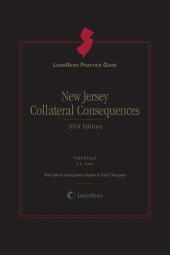 New Jersey Collateral Consequences includes a multitude of Practice Tips that transition smoothly from legal analysis to practical application of a point of law. Todd A. Berger is currently an Assistant Professor of Law and Director of the Criminal Defense Clinic at Syracuse University College of Law. Prior to joining the College of Law, he was the founding Managing Attorney of the Federal Prisoner Reentry Project at Rutgers School of Law-Camden. Previously, he worked as an assistant public defender with the Defender Association of Philadelphia, representing indigent defendants throughout all stages of the criminal justice system, from preliminary arraignment through trial and post-verdict motions. He worked as a supervisor in both the Municipal Court and Felony Waiver Units, assisting new attorneys in trial preparation and courtroom practice. He also served in the Major Trials Unit representing clients in jury trials involving the most serious non-homicide felony charges. He was also a Lecturer in Law at the University of Pennsylvania School of Law where he taught the Criminal Defense Clinic. Professor Berger earned a bachelor's degree from the George Washington University and Juris Doctor from Temple University School of Law. He also earned an L.L.M. in Trial Advocacy from Temple University. Professor Lore has been an advocate for children and a leader in providing teaching and training to students, lawyers, and the public interest community in New Jersey, the region, and throughout the Country. 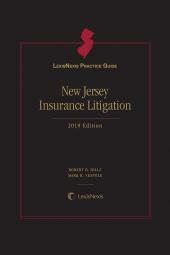 He currently is the Director of Trial Advocacy at Rutgers University School of Law – Camden. He also donates hundreds of hours per year training public interest attorneys in this region and throughout the Country. He has litigated hundreds of cases before a variety of tribunals as a fellow at the Northwestern University School of Law, an Assistant Public Defender in Philadelphia and Cook County (Chicago), and the Director of the Children’s Justice Clinic at Rutgers. Professor Lore also serves as an expert on issues of trial advocacy, children's rights, and juvenile law and has been a frequent contributor to media outlets around the country. He has been a faculty member for the National Institute for Trial Advocacy (NITA) since 2004 and was their “2011 Volunteer of the Year.” J.C. also has published numerous articles in the area of children's rights. In 2011, Professor Lore created and now directs the Center for Public Interest Training at the Law School which provides free training for public interest lawyers. Professor Lore's teaching was recognized by Rutgers when he was awarded the 2012 Chancellor's Award for Civic Engagement and the 2013 Chancellor's Award for Teaching Excellence. Peter Thompson focuses his law practice upon representing people charged with violations under state criminal and U.S. immigration laws, immigration removal defense and those seeking to lawfully enter and/or remain permanently in the U.S. Mr. Thompson joined the Defender Association of Philadelphia in 1999. There he represented clients at every stage of the criminal justice process, including at trial and in direct appeals. In 2007 Mr. Thompson assumed the Directorship of the Defender Immigration Project within the Defender Association. In this role he provided immigration consequences consultation services, provided direct representation of non-citizens in notable cases and trained and advised, and continues to train and advise, members of the bar and bench regarding the immigration consequences of criminal convictions. In 2012 he joined the law faculty of the Charlotte School of Law, in Charlotte, North Carolina, to serve as the founding Director of their Immigration Law Clinic. In 2014, continuing his passion for representing people in complicated legal matters, Mr. Thompson founded The Law Offices of Peter J. Thompson in Philadelphia, Pennsylvania. In addition to direct representation in select matters, Mr. Thompson provides consultative services for attorneys choosing to represent non-citizens in criminal court. He also regularly teaches lawyers wishing to improve their skills in this complex area of the law. Mr. Thompson is admitted to practice before all state courts in Pennsylvania, the United States District Courts for the Eastern and Middle Districts of Pennsylvania and the United States Supreme Court. Mr. Thompson earned his Juris Doctor from Villanova University School of Law and a LLM in Trial Advocacy, with Honors, from Temple University School of Law. Prior to law, Mr. Thompson taught for several years on the Navajo Nation, Arizona, and worked as a news journalist for the Irish News in Belfast, Northern Ireland. He may be reached at peter@thompsonlawoffices.org or 484-686-0400 and the firm website is www.thompsonlawoffices.org.